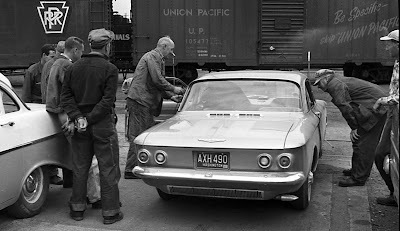 There are all sorts of things to love about this photograph, including that righteous dark green Washington license plate (A = King County), a non-rusty Corvair, and old dudes with hats. No doubt half of them were smoking while listening to the playback tapes! 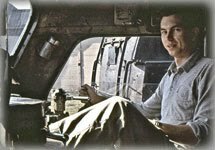 Elwin Purington's work can also be heard on "Northern Pacific - Farewell to Steam," a great 30-minute video of the final Seattle-area steam excursions on the NP in 1957. Great stuff.